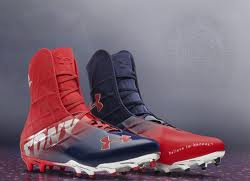 This is a really stylish looking pair of Under Armour shoes - comfortable, light, and fits well. Among its coolest features is the Foot Sleeve, which is an inner elastic lining under the tongue that is snug enough to permit you to wear the shoe without laces. It's a basic running and athletic shoe that provides enough support to blunt impact to the foot. This is critical for runners who have suffered from sore ankles in the past after heavy running. The mesh lining in the front area will make the shoe nippy to wear in the winter months, but airy and perfect for spring and summer wear. The Blur Pro FG shoes are middle of the range as far as quality Under Armour shoes go; good and solid, but not the top of its line. It's notable for the mix of breathability (a myriad of holes around its black and yellow exterior) and durability (thick shoe). It includes the Micro G mesh, and the very squishy 4D foam in the sole, which forms to the foot and whose function is to absorb or "blur" out the impact of the feet during runs. Some users report it can become squeaky if excessive sweat is generated by athletic activity. Snugly fitting at the sole, and providing good traction on the outsole, the Blur Pro FG delivers good comfort and performance for short distance running. Runners will appreciate the Janan Running Shoe, with a grey and black frame that resembles a trail shoe (particularly due to the ridges on the outsole), but performs as a very durable running show once its rubber hits the road. It's built to handle just about any terrain that it comes across. Its versatility permits it to serve as a tough terrain shoe, or as a cross-trainer for multi-purpose or even military training. The grey exterior mesh removes heat easily by design, and customary foot sleeve to hold the foot snugly in place. They also provide extra support under the ankle for additional power during movement. If this Under Armour Shoes review (and the ones above) hasn’t provided enough detail, you can find more reviews through various online searches.